“I don’t see why we should just sit around in basically an assembly and think about what happened when we can do our own part, when we can walk out of the school and show our own rights and our own supports and freedoms. Why are we just sitting here? We have so much options to do and we just decide to sit there…Why remember when we can do something?” said junior Mindy Nguyen. “I find it very interesting that everybody in the community is down to work together and come together as a family like how Fountain Valley is,” said senior Steven Le. “The walk out is a great way for students to express their First Amendment. I think it’s a great movement because it shows that students can make a difference and state their opinions on what they think of the situation,” said senior Tammy To. “This protest will definitely help out a lot. Obviously, we need change. We can’t let this happen anymore. Shootings are constantly happening…It’s important to talk about it now and not later. We need to end this now,” said sophomore Ben Nelson. “I believe school shootings are something that shouldn’t be happening especially with our modern world right now. For us, we should be the change and we should make the change and start speaking out,” said senior Loulya Alcharbhai. “It’s a way to pay respects and makes it seem real and close to home because I feel that the people that don’t put as much importance to this issue…It can happen to you at any moment. I feel like it grounds you as a human. It makes you [realize] that these victims were really people and not just names or a body count,” said junior Deanna Lim. “I think it’s about time that serious action is taken for these sort of things. Sandy Hook, we were like never forget and those other shootings like Kent State and Columbine, we [said] never forget, and then nothing happened. But I feel like now since the victims of this shooting were older and their peers that had to go through that ordeal are older, now they’re advocating for change. Its different than the other times in which its been elementary schools. I’m glad that this is happening. It looks like we actually might get some change out of this one and make sure this doesn’t happen again,” said junior Emil Allen. “Our lives. Our rights. Our future. We shouldn’t be afraid to learn. I shouldn’t have to be scared to have a bullet in my stomach when I’m taking my algebra quiz. This isn’t right and it doesn’t matter how much money they give us. Our lives aren’t worth any money,” said sophomore Safa Yosafi. “I think it’s very inspiring and empowering for all the students to take lead in this because we’re practicing our First Amendment, and we’ve never [been] more powerful than this year because of all the school shootings that have been happening. I support it 100%. It’s okay if I get marked absent, if I get in trouble. Missing school is worth speaking out on all of the lives that were lost,” said junior Rena Youssef. “It’s pretty cool to seeing everyone come together and stand for something that definitely needs to change,” said senior Samantha Molina. 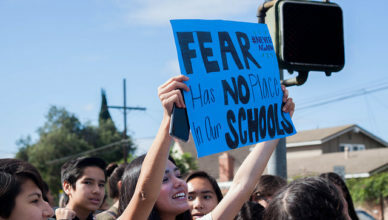 “I’m honestly really happy with how many people showed up, like I was tearing up earlier because this is a really sensitive subject to me and it’s not fair that people should be in fear about us at school…[Schools] are where our safety is promised the most, and it’s very necessary and important,” said senior Sam Bui. “It’s very unique because i’ve been here for four years, and I haven’t really seen this before. I’m actually surprised that everyone is down to leave school and walk out,” said senior Dylan Huynh.